Owen Davis Jr. plays Bunker Bean, a meek and mild office worker who loves the boss' daughter (Louise Latimer) from afar. Bunker impulsively visits a mystic, who gazes into a crystal ball and determines that Mr. Bean is the reincarnation of such past leaders of men as Napoleon and an Egyptian Pharaoh. Armed with new confidence, Bunker charges back into his office, gives his boss (Robert McWade) a piece of his mind, and becomes a hotshot businessman. Several reverses later, Bunker Bean realizes that he doesn't need to rely on his imaginary "past lives" to make good and to win the girl. 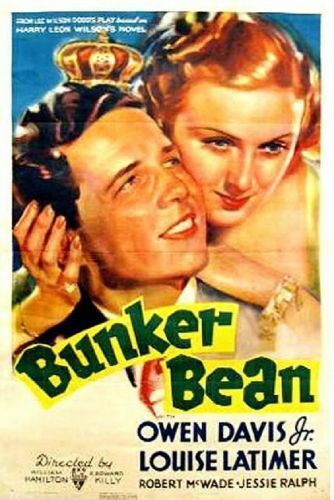 Based on the novel by Harry Leon Wilson (and its stage adaptation by Lee Wilson Dodd), Bunker Bean was the third film version of this enjoyable "worm turns" fable.